Dragons are awesome. Dragons inspire me to create a world (or twelve) where they aren’t evil. And Nicole Conway is the author of a fantastic series featuring Dragons. Now, she’s beginning a new series. Lovers of dragon tales and fantasy quests will surely rejoice over this new addition to their book shelf. In the interest of promoting independently published authors, I often agree to review new releases. In the case of The Vanished Knight by M. Gerrick, I agreed to review the first book in her series The War of Six Crowns in exchange for a free eBook copy. For those of you new to book publishing in the Amazon paradigm, the goal is to build chatter about your existing titles so that when a new title is released, people are excited to snap it up. I admire the indie authors who willingly put themselves out there with minimal support because they believe in the story they have to tell. I read this book between July 6th and 9th but waited to post the review on my blog until today. Why? 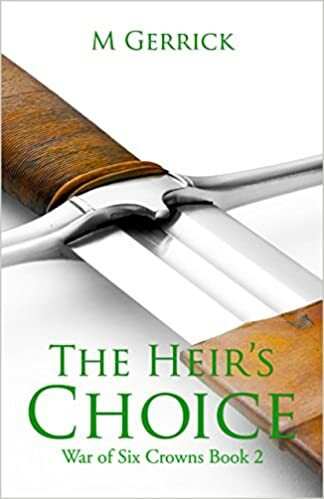 Because today, the second book in the series, The Heir’s Choice, releases on Kindle today. Get your copy by clicking here. Callan, orphaned at the age of eleven, is a foster child with a strange entity living within her. (Don’t get too intrigued by this entity because we learn NOTHING about its origin or real purpose in this book.) She also is plagued by strange dreams of knights and murder. She lands into a new foster home, where her wealthy “brother” is less than pleased to have a new sister. Apparently, he had a sister who died (but there are mere hints about how and when) and his parents should have sought his permission before trying to replace her with this mousy girl. They head off to an elite boarding school that is situated near a supposedly haunted castle. Callan likes to blend in, hide in plain sight, in order to cope with new situations. Unfortunately, several things happen the first day of school to prevent that. In what should have been a pleasure trip, Callan falls into the hands of kidnappers from an alternate world. She is rescued by a boy from school, who apparently is a knight in the other realm. Soon she discovers that her family might not be as dead as she always believed. This world is on the edge of war (as the title of the series suggests), and Callan appears to be caught between two powerful races who despise and distrust one another. Does my summary end abruptly? So does the book. This is one of the reasons I give this book a 3.8 out of five stars on my rating scale. The author created a winning character with Callan. The girl is compelling and sympathetic. Although she seems too passive at first, readers quickly realize the reasoning for this. Just enough of her history is given to us to help us understand her while yearning to find out more. The three male characters aren’t nearly as compelling. Although Darrion comes across like a jerk, his strong personality fits his station and background. Due to the sparks that fly between him and Callan, I imagine there will be a romance between the two of them in later books. Of course, Gawain already fancies himself in love with Callan. His easy-going personality makes him quite likable, but he’s not as well-rounded as he should be if he’s going to be a major player in the story. The foster brother, James, is my least favorite character in the story (even above Callan’s kidnapper and the unhelpful museum curator). He has zero redeeming qualities. When bad things happen to him, I feel no sympathy. He’s simply a spoiled rich kid who feel entitled to whatever he wants (and that is not relatable to me or any of the young adults I know). Apparently, he will play an important role in future stories because the sample chapter of the second book features him. His part in this story was minor, and his journey into the alternate world didn’t feel like natural story progression (another strike against this book and why it didn’t quite earn four stars). Too much time is spent in our world since the actual “story” takes place in Nordaine. Even the title speaks to events happening in this other reality. Most of the events at the boarding school, which took up chapters, could have fit easily into two or three scenes. I did like the arrival scene, but most of the other byplay didn’t add to the depth of story or characters. What was the problem in this story? Callan has an entity (still a mystery at the end of the book) that keeps her from developing close relationships, but she wants those. In the end, she discovers she might have family alive and well in the alternate world. I’ve read the book, contemplated what it was “really” about, and I’m still coming up blank (thus the lowered rating). The beginning was confusing, jumping between three perspectives, dreams and reality, this world and that world. I feel like some young adult readers would have closed the book before things started happening. All this book offers are more questions. Who are Callan’s parents? Why did someone want to kidnap her? What is the entity? Why does the book promise me a vanished knight when that is an underlying issue but not the heart of Callan’s story? Because this is Callan’s story. Sure, it might also be a little bit of Darrion’s story, but that felt like an introduction to the magical otherworld more than something important. It hints that James has a story, but most readers will be happy when very little time is spent with the rich brat. I clicked over to pre-order the second book as soon as I finished this novel. Do you need more of a recommendation than that? My biggest recommendation is to WAIT to read this until the second book is available. Lucky for you, that’s today. Your appetite will just be whetted for this universe Gerrick creates and this novel will end. Overall, I believe this book will entertain lovers of all fantasy genres. I had a hard time putting it down after the first three of four confusing chapters. The medieval setting of the alternate universe will captivate those who love historical fiction from that era. Love knights? You’ll meet some good and bad ones here. Think elves are out of this world? Right again. But they belong to the alternate reality created by Gerrick in this novel. The scope isn’t quite epic because the cast isn’t too huge to keep straight. Maybe this is why I enjoyed the book (even though this review may give a conflicted recounting). Pick up your copy of this book and it’s sequel today.